Michael Lee Aday (born Marvin Lee Aday on September 27, 1947), better known by his stage name, Meat Loaf, is an American rock musician and actor. He is noted for the Bat Out of Hell album trilogy consisting of Bat Out of Hell, Bat Out of Hell II: Back Into Hell and Bat Out of Hell III: The Monster Is Loose. Bat Out of Hell has sold more than 43 million copies. After more than 30 years, it still sells an estimated 200,000 copies annually, and stayed on the charts for over nine years, making it one of the best selling albums of all time. 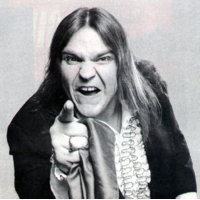 Although he enjoyed success with Bat Out of Hell and Bat Out of Hell II: Back into Hell, and earned a Grammy Award for Best Rock Vocal Performance, Solo for a track on the latter album, Meat Loaf experienced some initial difficulty establishing a steady career within his native United States. However, he has retained iconic status and popularity in Europe, especially the UK, where he ranks 23rd for number of weeks overall spent on the charts. He ranked 96th on VH1's "100 Greatest Artists of Hard Rock." Meat Loaf has also appeared in over 50 movies or television shows sometimes as himself, or as characters resembling his stage persona. His most notable roles include Eddie in the American premiere of The Rocky Horror Show, Eddie in The Rocky Horror Picture Show, Robert "Bob" Paulson in Fight Club, and Jack Black's father in Tenacious D in The Pick of Destiny (a character who, ironically, hates rock music and believes it to be evil).